Good morning everyone. I hope that you enjoy my newest feature, Shop Talk, which will be replacing my monthly "Hello Sponsors" post. Check monthly Shop Talk posts for news on what's coming up in the vintage world, exclusive coupons and sales, favorite blogs and beautiful things from my sponsors. Earlier this week, I shared a graphic on Revlon colors that are still sold today on facebook and instagram and a few of you makeup savvy girls mentioned the new release of the Revlon Legacy collection this spring. Some of us were unsure when the re-released colors would hit the shelves but Daffny posted a link to this great map of stores in the US that carry them. As soon as this dreadful ice melts in my home town, I'm going to scout out my local drug stores for them! Frantic About Frances, maker of amazing vintage inspired lingerie is coming out with a new clothing line- Daywear for Dames! I can't wait to see her beautiful new designs. The Glamorous Housewife recently blogged about one of her most important routines- meal planning. Bethany shares her tips for finding new recipes, getting inspired for dinner and creating balanced meals. I am also a big meal planner and agree, you can save so much time, money and ensure that the family is being well fed instead of doing last minute convenience foods. I recently found Dear Mr. Rabbit via her Instagram feed. (I love Instagram! I'm discovering so many inspiring people to read) and am loving her amazing style. 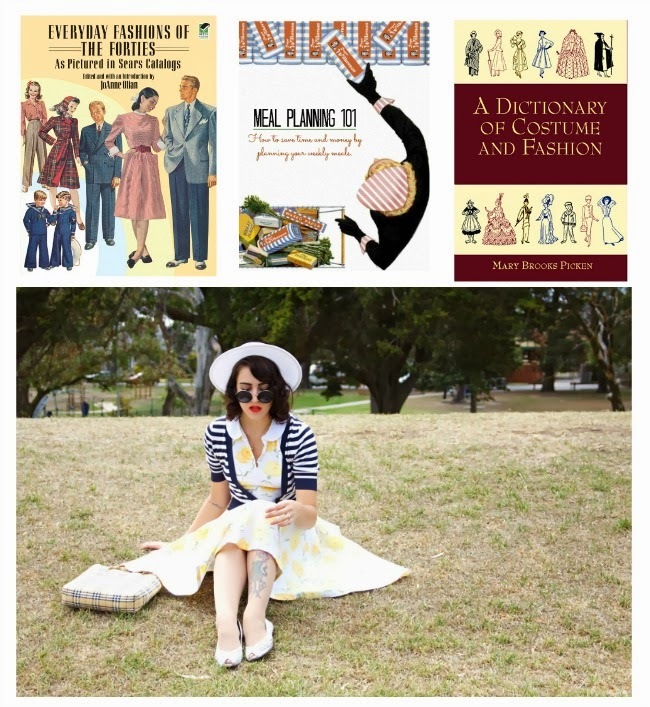 Taygan is from Australia and blogs about her personal vintage style, sewing adventures and fashion inspiration. From the Everyday Fashions series, this book covers the 1940s as seen in Sears catalogs. Find great inspiration for what they really wore back then. a beautiful reference book for fashion lovers and a great resource for bloggers too. This dictionary defines over 10,000 fashion terms including hat types, parts of a shoe, fabrics and more. One of my favorite things to do in the spring is go on picnics. Seriously, I am one picnic loving girl. We do breakfast picnics by the Missouri river, night time picnics for dinner in the park. Some days, the kids and I have picnic lunches on the front porch. This month's beautiful theme is all about picnic time- wicker, floral prints and what to wear while dining outdoors. I love the Everyday Fashions series! So inspiring and a good reminder that people back in the day didn't dress like movie stars any more than we do today. I really like this new series - I need to get my hand on that Everyday Fashions book! I'm so excited for the return of picnic/al fresco dinning weather as well. This winter just does not want to let up though (we got a few more inches of snow again this past weekend), so it may be a while more still before the gingham picnic blankets and gingham sundresses alike make their 2014 here. Thanks for posting about the Revlon lipsticks. I was able to pick them up at the Walgreen's right down my street, but they only had two of each shade...and someone in Omaha is walking around wearing the other ones! Hrumph. From the graphic, it looks like that was it for our area. Seems odd to create a demand for something then make it super-scarce. I mean, sure I get the "limited edition" aspect of it, but two of each shade on the display? I've read the same thing on a lot of other comments- they only stocked 2 or 3 of each. Doesn't make sense to me at all! I wonder if they might be testing the consumer reaction to see if they should do a bigger production of them? I need to get out this week and see if I can find some myself! !